When we planned the inaugural series of Breakfast Briefings earlier this year, we hoped to give our audience a taste of many fields. We partnered with Southwest Airlines and Fast Company to achieve the right cross section of industries. We're quite proud of the speakers we've showcased so far this season, covering entertainment, social media and fashion: Alison Moore of HBO, Jonathan Crowley of Foursquare, and Jennifer Swanson of Elie Tahari. Two Breakfast Briefings remain, which will focus on the non-profit and sports business worlds. At the end of the month, Charles Best, the founder and CEO of DonorsChoose.org will visit the series to talk about his non-profit that uses the power of the internet to connect caring teachers in needy public schools with individual donors. The site gives teachers a place to find funding for projects that are not supported by the school system. It's simple, direct and accountable. They call it "citizen philanthropy". To give you an idea of the kind of innovation you'll have access to when Charles Best is in the hot seat later this month, take a look at the non-profit's recent Hacking Education campaign. In an effort to improve education and focus school budgets on what classrooms really need, DonorsChoose.org invited developers to get creative. DonorsChoose.org offered up their data of projects, donors, and teachers from over ten years in operation to technology experts eager to build new software. You can see the full list of finalists here, whose participation and continued creativity bring attention to improving education with new technologies. There is still room to register for both remaining Breakfast Briefings, so sign up now for these intimate breakfast chats about creativity in business at The Southwest Porch. We'll be taking questions in advance that you have for Mr. Best, so check out his twitter account to get thinking, and leave them in the comment section here. 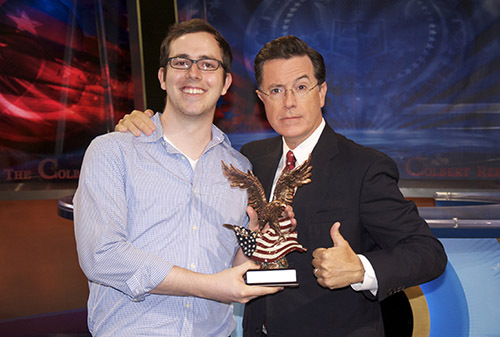 Stephen Colbert intoduced a great plugin...works fine..